Calhoun County provides north Mississippi with a bucolic idyll between the burgeoning metro areas of Tupelo and Grenada. The Skuna and Yalobusha Rivers run east to west through Calhoun at equal distance into the Yazoo via the Tallahatchie, so geographically the county is divided into thirds. The land is typical of north central Mississippi; rolling wooded hills creased by bottomlands. 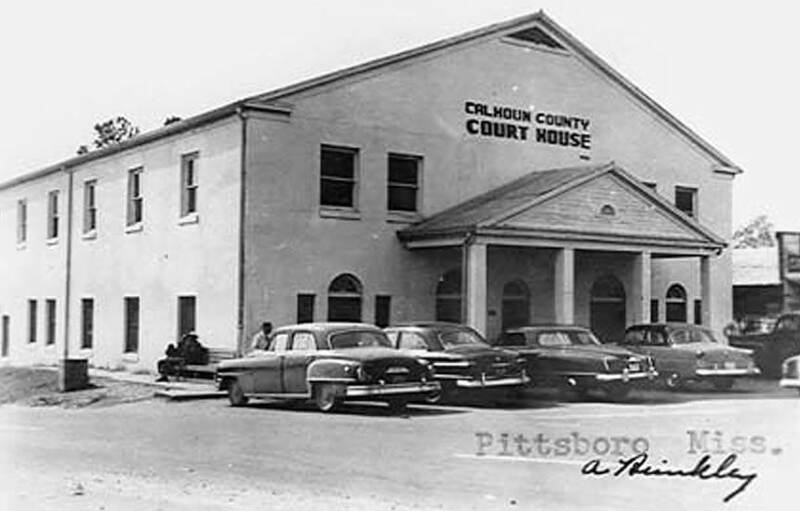 Given the proximity to Oxford, the county provides a model (if not original) of Yoknapatawpha, but the county seat Pittsboro is sleepy village, contrary to Faulkner’s bustling Jefferson. 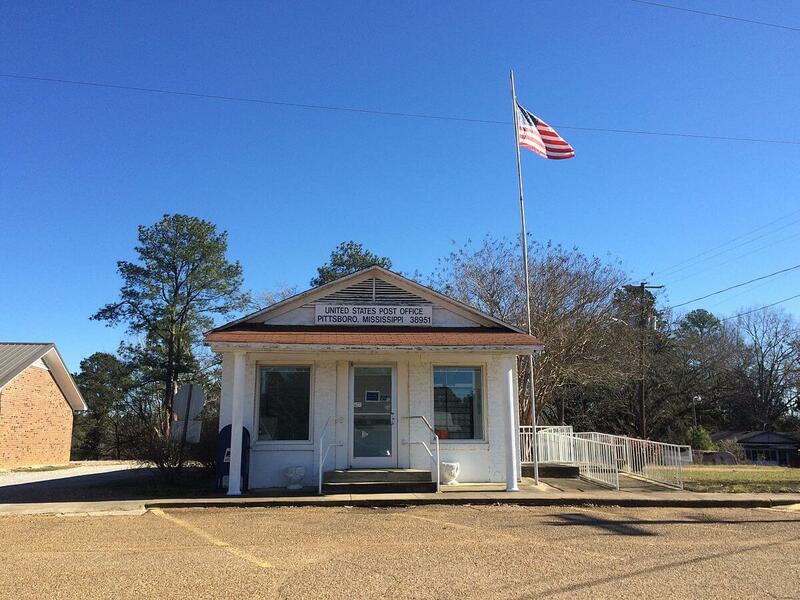 Pittsboro–the smallest county seat in the state of Mississippi, both in population (212) and in area (one square mile)–sits atop a ridge of hills that marks the southern edge of the Skuna River Valley. To the south, the land slopes in a more leisurely manner to the Yalobusha River just south of Vardaman, Derma and Calhoun City. Jo Brans is a member of the Reid family, which has lived in Pittsboro for time out of mind. Brans’ writings have explored many subjects, most in a scholarly vein, but Feast Here Awhile is a thoughtful examination of the changes in American cuisine from the 50s to the 90s. Feast Here Awhile (the title, by the way, is taken from Shakespeare’s Pericles, I,iv,107) is the story of her own culinary coming of age that takes her from the gentle hills of north Mississippi to Belhaven College in Jackson (which was strictly for young ladies until the year after she graduated in 1955), to various locations in Texas, Minnesota and, finally, New York City as well as through two marriages, one to an American journalist, the other to a Dutch academic. Brans moves from her mother’s kitchen through college cafeterias, Texas eateries and European fare on to DeNiro’s TriBeCa Grill in NYC. She also moves through (predictably, since the book has a pronounced literary bent) Child, Beard and Rosso, managing to mention Proust, Welty and Kerouac on the way. Indeed, Brans is somewhat of a compulsive name-dropper, both of the famous and the near-famous, but I was infinitely proud of her for managing to squeeze in Ernie Mickler and his wonderful White Trash Cooking. In short, Feast Here Awhile is a personal encapsulation of the American culinary experience in the second half of the twentieth century, and a compelling read from any standpoint. It helps, of course, to be up on the literature, culinary and otherwise, but Brans is an excellent writer and rarely boring. I would recommend this book for any Southerner interested in food and cooking, more specifically Mississippians of that bent and particularly the good people of Calhoun County itself. In preparation for this article on her, I attempted to get in touch with Brans for an interview, but countless attempts to discover her publisher or literary agent failed. Finally my friend Michelle Hudson, who heads up the reference department at the Welty Library asked, “Have you tried the phone book?” Well, no. Sure enough, in minutes Michelle gave me a number to call. When I did, early on a Saturday evening, a polite young man answered the phone and said he’d pass my message on to Jo. Within an hour Ms. Brans called. After making sure I was from Calhoun County (that didn’t take long at all) we chatted. She said she’d think about my request and let me know. Some three days later, I received her reply. I reproduce it here as a testament to her talent as a writer and her graciousness as a lady. After serious reflection, I have decided that the project you propose is not for me. I enjoyed writing Feast Here Awhile. I am pleased to find that it has found favor with readers, including, especially, you. Many folks, over the years since its publication, have looked me up (“on purpose,” as we Southerners say) to offer thanks and to relate their own pleasures at the table. I would have had material for several sequels. But no, I thought, and think, not. Essentially I have said in Feast what I have to say about the changes in American eating over the last five or six decades. It’s all there, from the joys of good home cooking and the family dinner table to the more complicated pleasures of Julia Child and those whom she terrified, taught, and liberated–usually all three–and beyond. Feast Here Awhile is also a personal odyssey, if that’s not too highfaluting a term for just growing up. I ate my way from childhood in a small Southern town through various stops along the road to life in New York City, and recorded the trip, hit or miss, in “The Food Book,” which became Feast. Though food was the focus, I was always aware as I typed away that I was recording the arc of my own life. No news for either of us there: that’s what writers do. Jesse, I’m flattered that you want to work with me, but don’t be content to retread. I really like your piece about Sambo Mockbee and I suspect, from our brief communication, that you want to be a writer, not an editor. If I’m right, cut loose. My way in was food. Maybe yours is food, too, but your food, not mine. Find your own way in. Tell your story. And send me a copy when the book comes out. 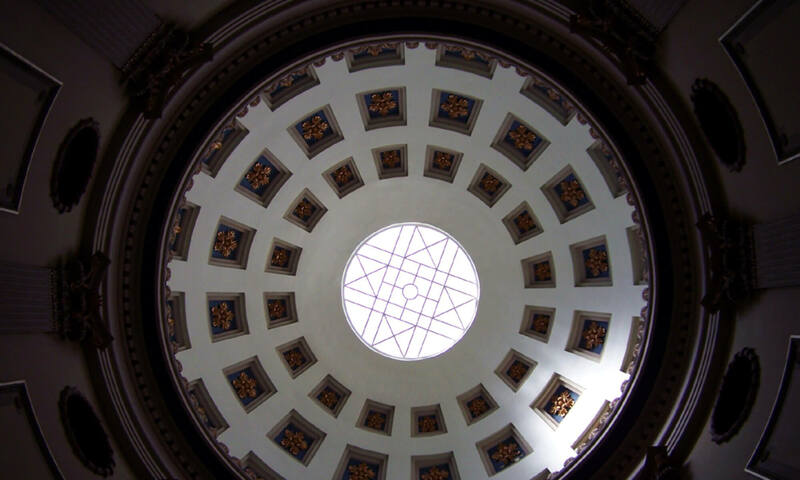 Mississippi: A Guide to the Magnolia State, first published in 1938, was an installation of the American Guide Series, a group of books published under the auspices of the Federal Writers’ Project (FWP). Though compiled by the FWP, the books were printed by individual states (Mississippi’s was sponsored by the Mississippi Agricultural and Industrial Board) and contained detailed histories of each state with descriptions of every city and town. The format was uniform, comprising essays on the state’s history and culture, descriptions of its major cities, automobile tours of important attractions, and a portfolio of photographs. Here is the section of the guide describing my home county of Calhoun at that time. 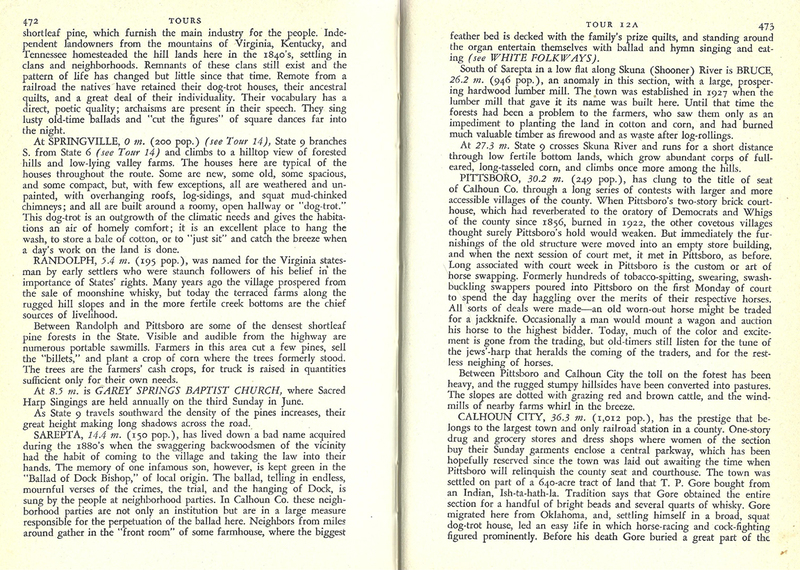 Note a description of the horse auction in Pittsboro, a suggested setting for Faulkner’s Spotted Horses.